Gravity movements occur when soil or rock moves downslope as a result of gravity. They are also called mass movements or mass wasting. Water is extremely important as a triggering mechanism for gravity movements because it adds weight and allows soil or rock to slip more easily. Examples of gravity movements are rockslides, slumps, mudflows, debris flows, rockfalls, and creep. • Landslides are rapid or slow movements of soil and/or rock. When landslides are made up of mostly rock, they are called rockslides. When they are mostly soil, they are called slumps. A slow-moving landslide in Giles County has affected U.S. Highway 460. 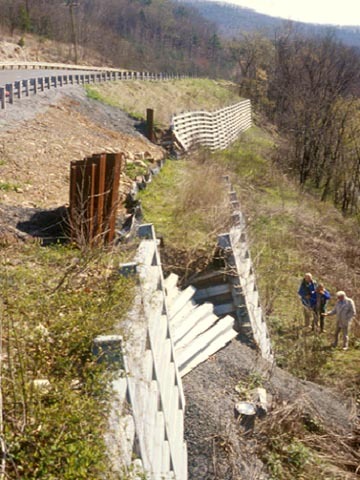 Repeated attempts to shore up the sliding material with retaining walls have slowed but not stopped the slope movement. Pressure from the slow-moving landslide mass has pushed this retaining wall downhill. • Mudflows and debris flows are rapidly-moving mixtures of soil, rocks, and water. Mudflows are made up of mostly fine grains; debris flows are made up of mostly coarse grains. 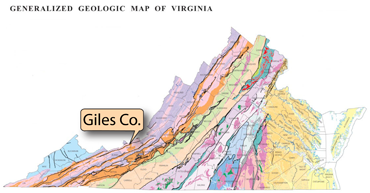 Debris flows have occurred several times in human history in the Blue Ridge. 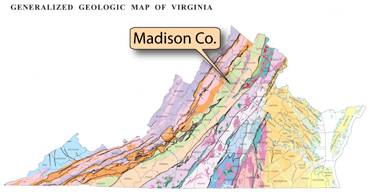 In 1995, a huge storm triggered debris flows in Madison County. The above left photograph shows the travel path of a debris flow. Note the large rocks and uprooted trees. Look for the people in the oval for scale. The above right photograph shows a damaged house that was moved about 30 feet by the debris flow.